Peterborough United missed a penalty on their way to defeat against the team rock bottom of League One. Craig Mackail-Smith’s 35th minute spot kick was saved by Coventry ‘keeper Lee Burge before the home side claimed the only goal of the game seven minutes into the second half through Ruben Lameiras. The Sky Blues, who would have been relegated with a defeat, deserved their win against a Posh side who laboured throughout, just days before owner Darragh MacAnthony chairs a meeting re player contracts for next season. 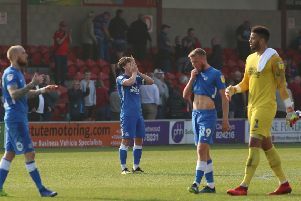 Posh manager Grant McCann dropped his skipper Chris Forrester and his top scorer Tom Nichols, but the midfield diamond was retained, even though Posh improved markedly when it was ditched for the final 20 minutes of last weekend’s win. Coventry didn’t bother matching the Posh system and revelled in the space available in wide areas, but McCann’s men should have reached the interval in front after winning a 35th-minute penalty. Martin Samuelsen, the man who replaced Forrester, earned the spot kick with a dazzling dribble that was ended by a trip. Up stepped Mackail-Smith to try and give Posh the lead but his shot was struck hard rather than well directed and home ‘keeper Lee Burge saved with his legs. Mackail-Smith wasn’t great at penalties in his pomp. He was no Grant McCann. Marcus Maddison saw Posh’s previous penalty saved at Port Vale so why Michael Bostwick, the man with a cannon in his right boot, wasn’t restored to spot-kick duty was a mystery. In truth a half-time lead would have flattered Posh as Coventry always looked the slightly more menacing going forward. Stuart Beavon rattled an upright with a terrific overhead kick before George Williams skipped past Anthony Grant and into the penalty area, but inexplicably chose to try and pass to Beavon rather than shoot. Posh ‘keeper Luke McGee then had to react well to thwart Jordan Turnbull from a corner. Mackail-Smith hooked a shot wide of the post for Posh while Michael Smith, skipper for the day, twice crossed too closely to Burge when well placed. There was a parade of Coventry legends at half-time and maybe the presence of Tommy Hutchinson and Mickey Gynn gave the home side a lift as they scored within seven minutes of the re-start. A fine tackle from Gael Bigirimana on Grant started the move with the ball transferred quickly to Lameiras who rifled home across McGee from inside the penalty area. Almost immediately Samuelsen glanced Smith’s cross wide and just past the hour Junior Morias, who had been very quiet, smashed a 20-yarder against the post - both moments arriving after periods of home dominance. Posh did rally after making three substitutions, but Morias missed the best opportunity to equalise eight minutes from time when heading substitute Taylor’s cross straight at Burge. The rest of the game drifted aimlessly with Posh rarely making a dent in a determined rearguard. Posh: Luke McGee, Michael Smith, Andrew Hughes, Jack Baldwin, Michael Bostwick, Jerome Binnom-Williams (sub Paul Taylor, 72 mins), Anthony Grant (sub Chris Forrester, 65 mins), Martin Samuelsen, Leo Da Silva Lopes, Marcus Maddison, Craig Mackail-Smith (sub Tom Nichols, 65 mins), Junior Morias. Unused substitutes: Ryan Tafazolli, Brad Inman, Andrew Hughes, Mark Tyler. Coventry: Lee Burge Kevin Foley, Nathan Clarke, Jordan Turnbull, Ryan Haynes, George Thomas, Gael Bigirimana, Ben Stevenson (sub Callum Reilly, 70 mins), Kyel Reid (sub Jodi Jones, 46 mins), Ruben Lameiras, Stuart Beavon. Unused substitutes: Reice Charles-Cook, Chris Stokes, Dion Kelly-Evans, Marcus Tudgay, Michael Folivi. Goal: Coventry - Lameiras (52 mins). Cautions: Posh - Baldin (foul). Alan Swann will be at the game for the Peterborough Telegraph so check back for team news, a match report and match reaction.